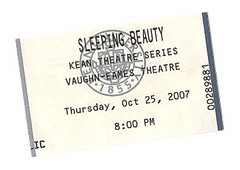 I went to Kean University last night to see Cathy in a play they were doing, Sleeping Beauty. I went to the big theater first but was redirected to another building. It was a very small room, but it was a really cool setting. Everything, and I mean everything, was made to look like a forest. It was a pretty incredible environment. As I walked in, I noticed there were no seats on my side of the room, and so I walked across the front of the stage area and, unbeknownst to me, almost stepped on Cathy. Actually, she said I stepped on her hat. Apparently they use the entire room as the stage. Anyway it was a great show and you should check it out if you’re in the area.